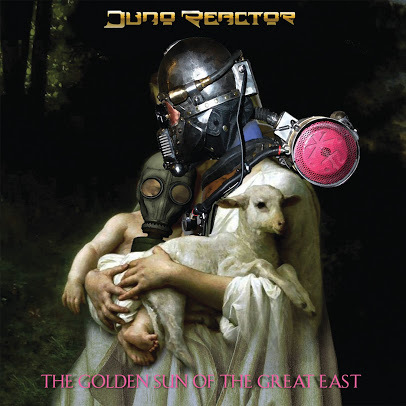 Juno Reactor’s sound is best described as a cinematic fusion of electronic, orchestral, and global music. According to Ben Watkins (the man behind Juno Reactor’s sound) The Golden Sun Of The Great East was inspired by the meditation practices and love generating techniques from the mystical kingdom of Shambhala. The songs presented on this release represent the natural source of radiance and brilliance in the universe via an exotic mix of surging trance beats, tantalizing embellishments, and lush musical flavors. Watkins’ work is frequently featured on soundtracks, so think of The Golden Sun Of The Great East as the soundtrack to your life because the songs will motivate your mind and your body (philosophically and on the dance floor). As a composer, Ben typically mixes traditional electronics and world influences in order to create his genre-bending take on trance. The album takes the listener on an audible journey that begins with the propulsive opener “Final Frontier.” The Middle Eastern textures of “Invisible” are quite serene. “Guillotine” dabbles in industrial and dazzles with its flurry of electronics. “Trans Siberian” is a great dance track that is offset by the tantalizing, seductive nature of “Shine.” “To Byculla” paints a beautiful soundscape that segues nicely into the dramatic closer “Playing with Fire,” which features a panoramic chorale of synths, strings, and haunting voices.